Villa Bahia Azul 2 is a beautiful three bedroom villa on the Bahia Azul development, in the resort of Corralejo in Fuerteventura. The luxurious development includes walled and gated security and there is also a restaurant on site, as well as a bar and coffee shop. The villa has a private pool and a roof top terrace which enjoys amazing sea views across to the neighbouring islands of Los Lobos and Lanzarote. 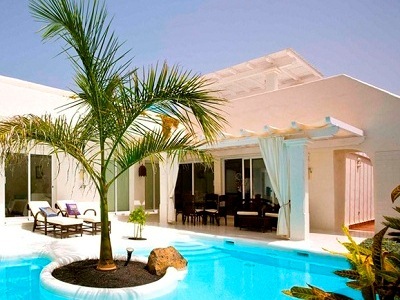 The villa offers guests both air conditioning and central heating, as well as wifi internet access. There are two double bedrooms and one twin bedroom and three bathrooms, all of which are ensuite. In the lounge there is both satellite TV with English channels and a DVD player. The villa also has parking. with double bed and beautiful en-suite bathroom. Shirpool shower. with double bed. Also en-suite.